How To Achieve Successful Ventilation In Buildings. How do you achieve successful ventilation in buildings? In my last post we established that ventilating a building is necessary. So, how to we go about it? The driver of air movement is pressure difference; high pressure air is attracted to low pressure air and this basic fact is often overlooked. If you fit an extract fan through an opening in the wall and switch it on, the room air pressure will drop with respect to other rooms and the ambient (outdoor) air. Air will be drawn into the room via cracks in the wall, window and under doors and you have little control over its source or condition. Switching off the fan without the shutter closing could cause air to flow into the room due to low pressure created in an adjoining room. If you fit a supply fan through the wall it will pressurise the room and air will try to leave via cracks, doors etc. However, the fitting of both supply and extract fans is likely to ventilate the room very well providing air does not short circuit between them. The standard practise of fitting an extract fan to a bathroom, as I am sure you have witnessed, is not very satisfactory, but if an inlet fan or even an opened window is used, moisture will clear in a few minutes. Of course, introducing unheated winter air will not be popular (although it would clear moisture from the bathroom), so some form of heating would be necessary. 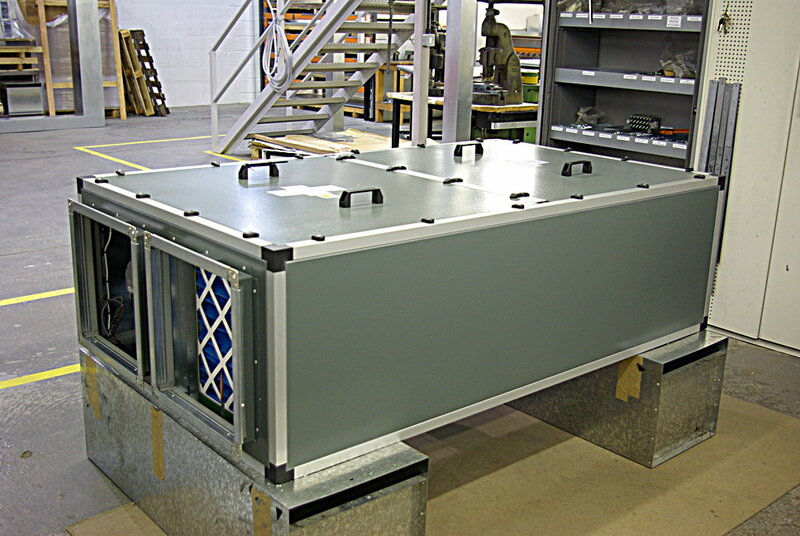 Neatafan make commercial input units complete with filters, heaters & controls. MVHR or air to air heat recovery units comprise inlet and exhaust fans which preheat input air using the warm extract air as it passes either side of opposing plates. The airstreams do not mix so stale air cannot contaminate fresh air. This is the best ventilation system for general use, providing both airstreams can be brought together. NOTE: Regular maintenance of the filters is necessary. Within a large building, quite complex patterns of air movement can take place, both between rooms and inside risers and wall cavities, all due to temperature and pressure differential. More testing of buildings in regular use would provide feedback for design improvements, but in my experience, once the building is handed over to the user its then up to them. In the past, the air volume (mass flow rate) was calculated from the air change rate published in a table for different types of room usage. This was considered to waste energy when the room is not much used, so demand control ventilation was prescribed. This requires a fully speed controllable fan motor and some means of sensing occupation. When it was first introduced a confusing array of control inputs were used, such as PIR ( on/off or high /low ), temperature, CO2, or even manual (seldom switched on). An unused boardroom would need time to lose its musty smell and low air movement can lead to turning on the air conditioner to feel cool. Also the extract system may be shared with other rooms, causing unexpected airflows as described previously. Energy is saved at the expense of comfort! Neatafan has various solutions to these problems as described in the next blog.